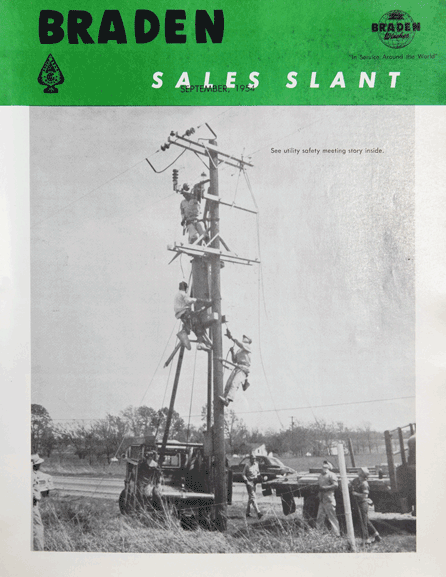 We're celebrating 95 years in 2019, and we have an amazing history of product development and innovation that has been put to use in the Utility Industry. Here we'll be sharing stories about how BRADEN has been a part of the safe operating story for the past nine and a half decades. Limited time download of our September 1954 newsletter. All BRADEN winches and hoists meet the required safety and environmental standard for utility use. When operating a BRADEN winch, always keep at least five wraps of cable/rope around the drum when in use. This is absolutely required when operating at rated capacity.